After the tragedy of September 11, 2001, White Memorial made an effort to open communication within the Muslim community. Dr. Art Ross, senior minister at WMPC at that time, organized a program entitled “One God, Three Faiths" with the Islamic and the Jewish Communities. The three Abrahamic faiths met in mosques, synagogues, and churches to learn and share each's other religions, beliefs, and common cores of faith. The first program ran six weeks and additional programs followed. Meetings were held at Temple Beth Or, The Islamic Association in Raleigh, and White Memorial Presbyterian. Other churches in the community who joined the group included St. Francis Catholic, First Baptist of Raleigh and Grove Park Baptist. Through this interaction, each faith gained a deeper understanding of their own faith and each other's. The experience deepened interest in the Middle East, with the desire to visit the Holy Land. The group wished to visit traditional historical sites and learn more about the issues surrounding the conflict in the Middle East. Six months of study and preparation preceded a trip in March 2009, when twenty-five (25) members of WMPC traveled to Israel, Jordan and Palestine. The trip was led by Clark Plexico and Dr. Art Ross. Three weeks were spent visiting Jerusalem, Masada, the Dead Sea, Gallilee, and organizations who work to pursue a just peace for Israel and Palestine. The group was fortunate to have a meeting with Father Chacour at Mar Elias School, (MEEI), in the Palestinian village of Ibillin. They also had presentations from Family Circle, and Seeds for Change. The International Center in Bethlehem and Bethlehem Bible College were visited. A chance encounter with volunteers from Ecumenical Accompaniment Program for Palestinians (EAPPI) had an impact on the group. The trip experience led Don Munford to organize and chair the first Middle East for Peace and Justice Committee at White Memorial Presbyterian Church. The Presbyterian Church has always had education as a priority in its mission. Our observation of the conflicts in the Middle East showed education to be vitally important, as well as peaceful resolution. This became the focus of our mission and funding. Dr. Christopher Edmonston and Dan McConnell led nineteen people on a trip to the Holy Land in 2014. The trip was similar to the 2009 trip, exceptions included visits to Aquaba, Eliat at the Red Sea, Safed and Tziorppi in Galilee. The group was welcomed at Mar Elias School (MEEI) by Archbishop Chacour, who had retired as head of the school in 2014. 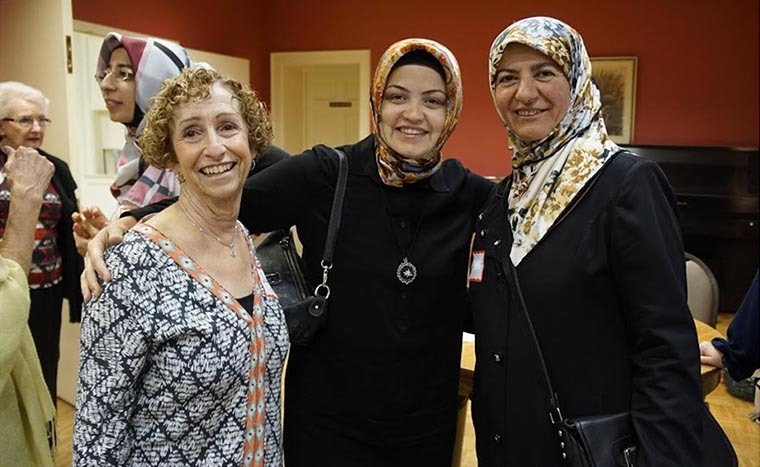 The Middle East Peace and Justice Committee maintains an ongoing relationship with Temple Beth Or, a Reformed Jewish Congregation on Creedmoor Road. Temple Beth Or held Sabbath services in our sanctuary in the 1990’s while their temple was being renovated, and since that time, we have enjoyed sharing interfaith opportunities. We have held joint hunger-related projects, and are actively exploring other opportunities for joint service, education and fellowship. Approximately 2500 students of Christian, Muslim and Druze heritage from all over the Galilee gather at Mar Elias schools to study together as one community of learning and service. Jewish teachers are on the faculty, and Mar Elias schools promote partnerships with Jewish schools and organizations. Elias Chacour, a three-time Nobel Peace Prize nominee and author of Blood Brothers and We Belong to the Land, founded Mar Elias Schools. Father Chacour realized that the future of the citizens of the state of Israel, and all of God’s children in the Holy Land, would depend on educating the young in the ways of peace, reconciliation, respect, and justice. Chacour's books are available in the church library.